Hepatocellular carcinoma (HCC) is amongst the 5 most common cancer types worldwide. The majority of therapeutic situations are considered as palliative. Sorafenib is the only effective therapy for advanced Hepatocellular Carcinoma (HCC) patients, mainly affecting RAS/RAF/ERK-signaling. Malignant melanoma (MM) reveals rapidly increasing incidence and mortality rates. 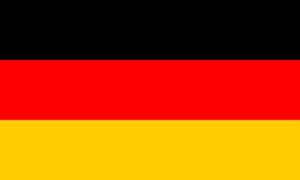 By now, BRAF inhibition is the standard therapy for advanced melanoma in patients carrying BRAF mutations. Only ≈50% of melanoma patients harbor therapeutically attackable BRAF mutations, and overall survival after treatment with BRAF inhibitors is modest. RAS/RAF/ERK-signaling is strongly involved in both HCC and MM development, progression, and resistance to current therapeutic approaches. 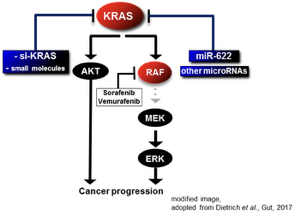 Moreover, in recent years, a growing number of microRNAs (tumorsuppressive miRs or oncomiRs) were found to be dysregulated in HCC and melanoma thereby influencing critical pathways involved in the regulation of procancerogenic mechanisms like RAS/RAF/ERK and PI3K/AKT-signaling. In our group, we study the molecular changes leading to acquired therapy resistance to Sorafenib treatment in HCC and to BRAF-Inhibitor treatment in MM, with a focus on dynamic alterations in major signaling pathways that are directly targeted by common therapeutic approaches, like the RAS/RAF/ERK and the PI3K/AKT-signaling cascades. We also address the involvement of microRNA-dysregulation on these and other carcinogenic alterations.